The camp is quiet at this time of the day, the children already at school, the students at university, thus no big farewell ceremony. In fact, there is only Abed to come and say goodbye. We know why now: he is the only one who doesn’t go to school, not anymore since the trouble he had (cf his testimony on April 8). He works at the EJE centre. We have hardly had time to drop our bags on the small parking area where the van is going to pick us up that we see him coming, dressed in his usual striped orange sweat-shirt. He must have been looking out for us in order not to miss us before our departure... He looks a bit off-colour, but we want to shake sadness off him, help him pull himself together: a few more teasing, hugs and promises to send e-mails. Some of his buddies go past our group at that moment. They pull his leg but maybe only because they feel a bit jealous of him: it is not commonplace for boys to be hugged by girls in the camp! Margot concludes that, definitely, Abed will have tasted some of the good sides of our western culture. Back to "the other side"
The van-driver drops us in front of the wall that bars the road. He can’t drive us any further. A brutal reminder of the reality of the Palestinians living in the West Bank: for ten days, we have been well and truly « confined » with all of them. 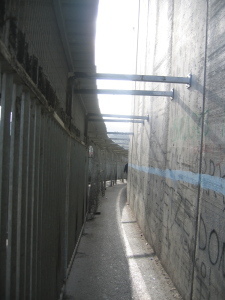 We put our bags on our back and take the zig-zagged wire-netted corridor that leads to the inside of the concrete bunker Bethlehem Checkpoint is. We have to cross it again to go back to the "free zone". The security checks in this direction (- to Jerusalem, and so to Israel), are more thorough. Of course. Green! The Palestinian ladies go first, the one after the other, between the jaws of the turning gate. Then Anne-Claire gets into it... and finds herself trapped in a cage! Somewhere, an invisible soldier has pressed on a button without giving further notice: turnstile blocked. Little moment of panic: Anne-Claire tries to push or pull the bars. In vain, it is well blocked. Imprisoned for ever? But I haven’t done anything!... How stupid can the first idea coming through your mind be in such moments... One of the Palestinians who is following our group waves at us:"la, la !..." ("no, no, it’s no use"): she can only step backwards and go out of her prison. He has a gentle smile. It is OK, don’t worry, the light will turn green soon, it’s OK. Only it will do so when they will feel like it. "They": the soldiers in charge of the checkpoint this morning, young men and women who have hardly left adolescence behind and let power go to their head. .
Anne-Claire then Margot go in. On the other side, they bump into a Palestinian family: the father, the mother and their 5-or-so-year-old boy. The mother looks so tired, even though she must still be quite young. She has to take off some clothes, take things out of her handbag, then out of her pockets, take stuff out, take stuff out, again and again, because each time she goes through the detector, it starts ringing. Same fuss with the father, and with the child, who has obviouly had it. Finally, they manage to go through the machine and Margot the Anne-Claire can lay their bag on the bagage carousel. No problem, they can go… The funny thing is that Margot kept her belt, jewels and cell-phone on her… Just a mere question, she says afterwards: is this checking equipment operated by the soldiers or is it schizophrenic when it takes its fancy? Then, in turn, we all go through the turnstile, lay our backpacks and guitars on the black carousel of the scanner. Because we don’t want to have any trouble, we all take off our shoes, jewels, belts systematically before going through the electronic gate and retrieve everything on the other side calmly. This could be seen as submission but the way and the spirit with which we do so makes us feel stronger than the whole system : you control the Palestinians ? Please, do the same with us then. Maze of narrow passages. Our guitars and bags get stuck in the gates and turnstiles that follow one another. We finally catch up with the women who passed before us: they are queuing in front of the control-desks where passports, permits, certificates are being checked... Oh! there are human people working in there!... They don’t even have a look at our luggage. The soldiers here specialise in documents. Their eyesgo up from our identity photo to our face and back again several times. Ok, we can go. We finally emerge from this bloc of reinforced concrete and go past the large board we noticed at our arrival. It sets our teeth on edge: it welcomes people at Bethlehem checkpoint in three languages (Hebrew, Arabic and English), wishing them a "safe and pleasant" passage and concludes with “May you go in peace and return in peace." In the same surge, it asks them to make sure that the building made available to them is kept clean... It is not only ironical. It is blatantly nasty. The Alternative Information Centre is an association founded by an Israeli citizen, Michel Warschawski, Strasbourg chief rabbi’s son. It groups together Israeli activists who try to counter the disinformation the Israeli government and the official media (with the exception of "Haaretz" newspaper) subject the Israeli population to. Anne-Claire and Tanguy had had the opportunity to meet Michel Warschawski in the context of the conference he gave in Brussels in 2008. A man wearing great white moustaches, whose discourse is energetic, upstanding, clever, dignified. This rings a bell. Who told us about how the army breaks Israel’s youth? Ali Jiddah. Again, if different people from different sides tell the same thing, there must be something true in it, or? Question we put ourselves: isn’t pitching into human rights associations by calling them traitors a way to distract public opinion from the actual problem, which is occupation? So she encourages us to take part in it. 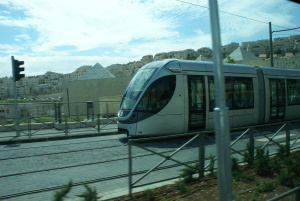 Along the same line, she tells us about Jerusalem tramway, which is for the most part financed by France (Veolia and Alstom company). Work started in 2002 and the tram is now on a test-run. Its track is 18 km long. Sixteen archeological sites were brought to light during its construction, which caused delays and an increase in the costs. But most of all, it is its legality that is questionable. Indeed, it links West-Jerusalem to East Jerusalem, and most of its route is in a zone of the town that Israel has occupied since 1967. The international community doesn’t recognize Israel’s sovereignty on this territory! What’s more, the tram, which connects the (illegal) settlements surrounding Jerusalem, will no doubt ratify Israel’s annexion of these territories. We thank Mary for her warm welcome and the valuable information she has given us. 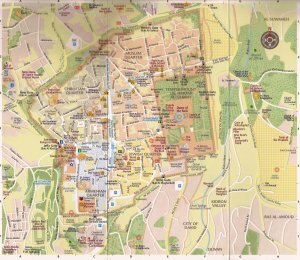 Then, we go for a little walk in this district of West Jerusalem, in which the AIC is. Several of the streets leading to the old town used to be mixed. They are lined with houses that for the most part of them belonged to Palestiniens. Today, the district is rather trendy and the city counsel wants to develop businesses and the hospitality industry for the tourists (read the account of our walk on Tuesday April 5 with Daoud). We are back at Damascus Gate and have some delicious falafels at our “regular” snack-bar, in front Jerusalem Hotel. There we meet our beloved Daoud, who has arranged for a van to take us on a little journey across West-Jerusalem, towards 1948 Palestine, territories that are now under Israeli control. Like Daoud, many Palestinian activists speak of two occupations: the one that started in 48 and the one that has been going on since 1967. It is true that the majority of the refugees met in the West Bank camps suffer from the 1967 occupation and of the colonisation that followed, but most of them originate from this "1948 Palestine", which is called Israel today. Many of them share Ali Jiddah and Daoud’s dream to see one day Palestine unified as one unique democratical and secular state in which all the citizens, whatever their origin or religion, would be home. The van first takes us from Damascus gate to Jaffa Gate. There it is impossible to miss the giant Israeli flag raised on the old walls. It was not there when the 2009 Taayoush was here... Daoud draws our attention on the fact that this flag is the first thing you spot at night when you approach the old town with all the lights that illuminate itl. A good symbol of the Israeli appropriation of the old town... We now follow the ramparts towards the South, towards Mount Zion. On the spot of the "no man’s land" of the 47-49 war (the famous green line), there is now an amphitheatre surrounded by lawn gardens. Many festivals take place there, organised by the Israeli municipality. At the foot of Mount Zion, Daoud shows us the first houses to have been built by Jewish settlers outside the old city between the two World Wars. Most of them belonged to members of the Zionist Congress. What is strange is that they could easily be mistaken for Dutch houses with their red bricks and sloping roofs. The only thing missing is a wind-mill and you would think you were in the Netherlands! This drives our Dutch friend Margot almost crazy! We pass Mount Zion to reach a headland that offers a fantastic panorama of the south-west of the old city (see map). To our left, the modern town of West Jerusalem. In front of us, the majectic ramparts of the old city, beyond Mount Zion. On its right, we recognize Ras Al-Amoud (the district Daoud lives in) and below, Silwan. A bit further, Mount of Olives. 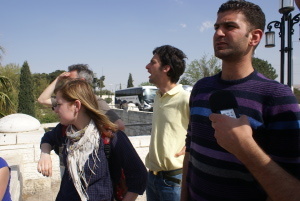 Daoud points out at the contrast between the western and eastern parts of the town. On the east, Palestinian side, the former villages, such as Silwan, have had to grow to face the natural growth in their population. Today, they are densely populated districts in which the old patched up houses, all of them decked out with additional floors, border more or less unfinished buildings on top of which are the typical black water tanks. On the west, Israeli side, the “Dutch” houses we saw a few minutes ago neighbour much more modern blocks of flats and even some sky-scrapers. An urban landscape that is definitely more western and familiar to us, Europeans. The time and place are well-chosen to have Daoud re-explain to us the town-planning projects of the municipality of Jerusalem, "Jerusalem 2020" and "Jerusalem 2050", which Daoud and Marwan told us about ten days ago. The first objective is to create a "ring" encircling the old town, which must be emptied of its last Palestinians inhabitants. In order to do this, any means will do: extending the green spaces or the pedestrian zones along the ramparts, building parking places and shopping centers (on the west, with Mamilla and infrastructures that overlap the green line), creating tourist attraction and religious theme parks (such as the "City of David", which is already opened in the heart of Silwan, another one will soon open in Josaphat Valley at the foot of Mount of Olives), undertaking archaelogical excavations right in the middle of inhabited districts (Silwan), which causes some houses to subside, etc. etc. As a second step, the plan projects to link (through a foot bridge spanning the former Jewish cemetary) the"City of David" to Rockfeller museum, which is situated on the north-east of the the old town. This would complete a "green tourist and religious promenade" that will totally isolate the Old City from the Palestinian part of Jerusalem. What will the Palestinians (and the Muslims from all over the world) do then when they want to go to Al-Aqsa mosque? The plan projects to have gangways built for them under Josaphat Valley, and a gigantic elevator to take them up to the esplanade of the mosques. This plan looks so ridiculous and insane that it is hard to believe someone could carry it out! But when colonisation et real estate development find a common ground, anything can happen. .
We settle on the bus again and drive towards the west. At the corner of a crossroads, Caroline recognizes the hospital she was born in; her parents showed it to her on one of their family trips here. Daoud gives us some information about the dictricts we are going through. In old days, the name of the Palestinian district we are now in was Al-Battar, but it was emptied of its Arab inhabitants in 1948 to make room for the Jewish settlers. This is what you call ethnic cleansing in English. The old houses, with their easily recognizable style, testify to the Arab past of this part of the city. Most of the people who were thrown out of them live now in East-Jerusalem. Some of them could come and visit their house from the outside, but nobody could get theirs back. The stories the old people tell about this district are passed on to the new generations in Palestine, as much as they can be. As we could notive during our visit of the old town then days ago->art400#old city], the "judisation" that was started in 1948 is still going on in East-Jerusalem, in the heart of the old town and of the districts that border it on the north, east and south. Daoud also tells us the story of the former Palestinian landlord of a house located in today’s Jewish quarter of the old city. One day, as he was passing his former house, he saw that it was on sale. So he called the given number and said he was interested in buying the house. He showed document proving he was the actual landlord, but the people refused to sell him his own house, even though he was ready to pay more than the price they asked. They told him that what was at stake was not money but his religion : he was not a Jew. The van follow its route: the houses become more and more scarce. On the outskirts of the town, the tarmacked roads make way for the green and wooded hills of the surrounding countryside. 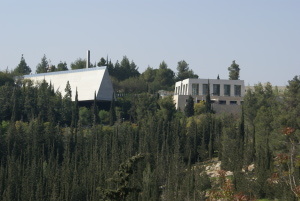 We spot Yad Vashem memorial, which those you feel like it will have the opportunity to visit tomorrow (no time left for it today). 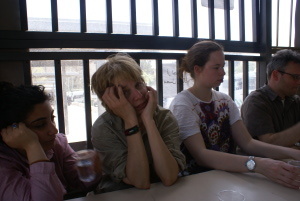 Laurie is particularly interested: she was talking about going in even before we left Belgium. Of course we have all heard a lot about this memorial-museum on the judeocide . It is a must for all the Israeli pupils and soldiers. 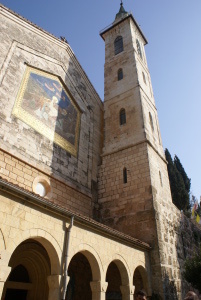 But, for the time, we head to the hill in front for a visit/pilgrimage of the Church of Visitation, in a little village that was once Palestinian. Its name is ’Ayn Karim. Its Arab inhabitants were evacuated in 1948, and most of them now live in East-Jerusalem. They are allowed to come and visit the site, but not to come back and live on it again. 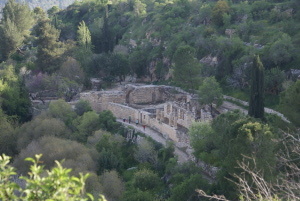 The hill shelters several Christian communities who settled on this holy place a long time ago: according to the Christian tradition, this is where the Prophet John the Baptist is supposed to have lived together with his mother Elisabeth, whom Mary came to visit when she was expecting Jesus. After a little meditation (for one of us) and some fond thoughts (for the others), we get back in the vanand drive to the site of Sataf, a Palestinian village, or rather, what is left of it: ruins lost in the midst of nature. Nature has regained ground and the lanscape is really beautiful now. 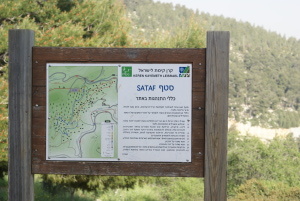 On one side of the road, there is a board for the tourists, which invites them, both in English and in Hebrew, to "a nice walk" in “Sataf’s natural reserve and park, named after a former Arab village that was evacuated in 1948”… With emotion, Tanguy remembers reading the name of Sataf two years ago, on the list of all the destroyed villages the inhabitants of Aida refugee camp originate from. It was part of the fresco they had painted inside the camp. We remember too what Daoud told us on April 4 about Lifta, another Palestinian village destroyed in 1948. As Daoud points to us, only very few people still inhabit this site and the neighbouring hills. The same is true for 90% of the villages which the Palestinians were driven out of in 1948. Indeed, despite all the space made available , the Israelis don’t want to establish populations here. The settlers prefer to go and settle in the West Bank, close to Palestinians villages that are still standing. The avowed goal is to acquire more and more territory there. But when they are asked about the Palestinian refugees’ right to return to their original places, the Israeli authorities answer that there is no room left for them on these sites! Daoud shows us then what makes these houses (or rather their remains) typically Palestinian. No doubt they are indeed. 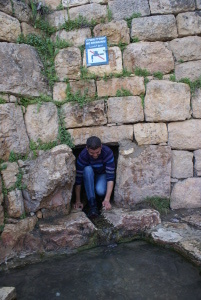 He also shows us the pipe system that enabled the inhabitants to transport water up to the centre of the village (just like the one we saw in Silwan) and to irrigate the cultures. This system is not exactly brand-new : people were already living here more than a thousand years ago! Some olive-trees are older than 2500. 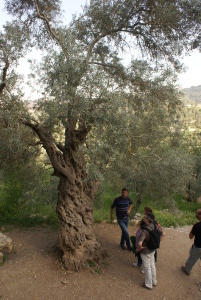 Daoud tells us that there is a huge olive-tree near Beit Jala (Bethlehem) aged 7000! It is easy to understand why this tree is a symbol for the Palestinians: it is solid, strong and well-rooted to its land. We cast a last look at this great landscape: how can such a beautiful and peaceful place have been the scene of so much horror? How can one pretend not to know about it? How can one have fun on the ruins of other people’s life? 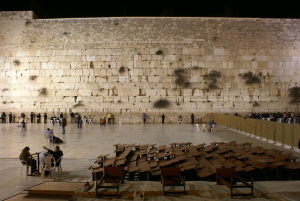 Once we are back in the old town of Jerusalem, some of us feel like going and communing with themselves (or engaging in private prayer, it depends) in front of the Wailing Wall, another place where memory bleeds. Here, the Jews lament on the painful loss of the Temple, the symbol of religious and political power, and of a for ever lost Covenant. As for us, who have become Palestinians at heart, we grieve over the destruction of the houses and the exile of the families we met behind another wall. 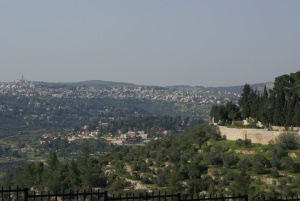 In Jerusalem, in the Judeo-Christian tradition, Mount Temple and Mount of Olives face each other, with a large cemetery between them. A curious metaphor of the cultural gap that separates two worlds: western-eastern, northern-southern, Jewish-Arab, rich-poor, black-white. That’s when we suddenly remember the inscription we saw yesterday at the Tent of Nations : "People building bridges"... Who is going to build these bridges? Read the testimonies collected by the Israeli organisation Breaking the silence. Read All-Out War, Coalition of Women for Peace. Exemple des effets de la campagne BDS et des conséquences possibles de la pression que constitue le boycott des produits israéliens cultivés dans les territoires de la Cisjordanie occupée : lire les extraits d’un mail de Jan Dreezen, Coordination Boycott Israël (COBI), envoyé le 18 octobre 2011. Let’s remember that for the Palestinian Authority, East-Jerusalem is to become the capital of the futute State of Palestine. On this subject, read the account of the Second Day of the Earth, devoted to Jerusalem. All together, eight Palestinian districts and thirty-nine villages were subjected to ethnic cleansing in the area of Great-Jerusalem, and their population were transfered to the eastern part of the town. Read article by F. Leroux on this subject. Read the article by F. Leroux on this subject. We can’t be in Jerusalem and not go and visit Yad Vashem ! For Laurie’s mother it was one of the conditions under which she would allow (or not) her daughter to join the project. Judeocide, or the genocide of the Jews by the Nazis, is often referred to as Shoah, a word that means "catastrophe" in Hebrew. On the use of this term, read for example the texts presented by Dominique Natanson. For more information on the former inhabitants of ’Ayn Karim, go on the following site: Palestine remembered. For more information on the history of Sataf and on what happened in 1948, go on the following sites Nakba and Palestine remembered. On this subject, watch the montage "Refugees" based on testimonies we collected in 2009. Palestinian resitance is going on: the project of « finding back traces of all that’s left since the Nakba » aims at making video documents on the Palestinian villages that were destroyed and subjected to ethnic cleansing. This work is done in collaboration with Jewish and Arab Israelis who are deeply involved in making people aware of the catastrophe it was for the Palestinians. They went to several towns and villages to write their articles and shoot their films. See for example the dossier on Sataf.